Remember the Doraemon Webcam? It's actually on sale now for $32! 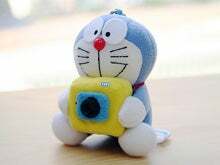 Cuteness personified, this Doraemon plush-cam can take VGA stills (640x480) and get 15FPS VGA resolution movies for use with Skype, MSN and other IM clients with video. It comes with a sticker for monitor mounting and a little chain so you can hang it from a wall. Who can say no to that face?